AUSTIN, Texas — November 9, 2011 — The process of establishing the world’s first operational lunar base and propellant depot business in space is underway as SEC launches its initial fundraising campaign. This comes in the footsteps of recent amazing new discoveries of huge deposits of propellant-feedstock ice on the Moon by NASA and other international space programs. 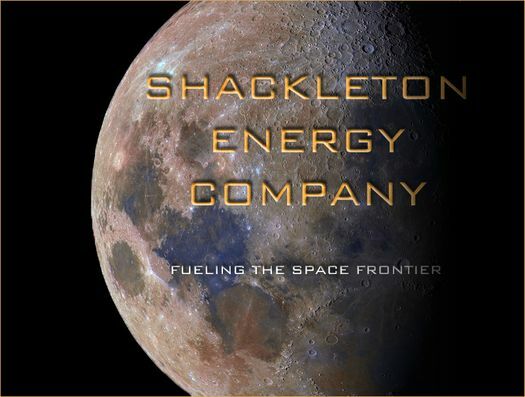 Joining forces with RocketHub, one of the largest crowd funding platforms, SEC [www.shackletonenergy.com ] seeks to raise the initial seed capital necessary to complete its top level planning in order to then secure the first major round of investment capital necessary to complete preliminary designs of all system elements. “Now that the business case analysis is complete, we are ready to move out with follow-on implementation steps. This is a huge program very complementary to, but significantly different, than what NASA is evaluating for terrestrial-fueled depots in space,” said Dale Tietz, SEC’s CEO. “SEC has formed its team from the best of the aerospace, mining, exploration, business and legal sectors,” said Dr. Bill Stone, SEC’s Chairman. “This is an undertaking that will challenge the best of us in the spirit of great explorers and industrialists of the past. We know what and how to do it and, crucially, have the team to do it. We will leverage the lessons learned from Government-sponsored space programs to the maximum. “After a phase of robotic prospecting, our crews will establish the infrastructure in space and basecamps in the lunar polar crater regions to supervise industrial machinery for mining, processing and transporting lunar products to market in Low Earth Orbit (LEO) and beyond. It is essential that we seize this opportunity now to provide low cost propellants in space as a means to jumpstart the new space economy,” Stone said. SEC was established to address the very specific challenge of providing more affordable access to and more affordable operations in space for everyone—and to do it privately using low cost, lunar-derived propellants sold in space. Today, space missions are very expensive because they have to lift from Earth not only the payloads, but also the additional propellants and tankage for in-space operations. With our fuel depots, we will significantly reduce that burden on tomorrow’s spacefarers. Our success will enable opening the space frontier to multitudes of new missions and opportunities, thereby improving life here on Earth and beyond. systematic utilization of the resources of space, as an example, space-based solar power systems can be built that will provide enough electrical power on Earth to service the needs of a mid-21st century civilization as our transportation and industrial processes transition away from fossil fuel energy. A significant accumulation of orbital debris in desirable orbits (such as LEO) from decades of space launches. For years, the world space community has studied this problem, but has not come to a consensus opinion of how to deal with it. Left unresolved, nations will continue to leave their launch debris in orbit, while insurance rates will climb to address in-space operating risks. As a result, it will become ever more difficult to find the right location or time to launch or operate satellites in space causing a potentially significant financial impact on the world economy. Exorbitantly high costs of launching any payload into space due to having to overcome Earth’s gravity and it’s punishing atmosphere. Today, the cost to launch payloads to LEO is ~$10,000/kg. Although there is heated competition in the world marketplace to reduce high launch costs, the fact is that it will be marginal and not conducive to a game-changing proposition until new propulsion systems are developed. The establishment of lunar-sourced, low cost propellants in LEO will ensure that industry and governments will have the foundation to address these enormous societal challenges––Shackleton Energy Company will provide that foundation. Dr. Bill Stone has dedicated his life to exploration and understanding of the world we live in. He has decades of experience leading autonomous robotic and crewed projects in exploration and technology development for the National Science Foundation, NASA, National Institute of Standards and Technology, and the private sector culminating in two back-to-back expeditions to Antarctica. He is currently leading a NASA project to develop an intelligent autonomous cryobot for transporting autonomous underwater vehicle science payloads through the ice caps of the outer planet icy moons of Jupiter including the development a scaled operational cryobot to be tested on the Greenland ice shelf in 2014. Dr. Stone will lead the first industrial explorers to start SEC operations at the lunar poles. It makes sense to obtain water ice from the Moon for in-space propellant. But I don’t entirely understand why humans are needed. Teleoperated robots should be able to handle all aspects of mining and repairs. Teleoperated surgeries are done every day. The robot Justin demonstrates fine teleoperated dexterity sufficient to repair robotic equipment including other Justin robots. …that lay in the house that Jack built. > Humans are there to fix the robots. Yes, so, that involves what? Unscrewing a bolt, removing a part, replacing that part with a spare…What can humans do that a teleoperated robot cannot do? Remember, teleoperated robots sew tissue together laporoscppically every day. A less than three second delay will only slow thing down not make it impossible to do. In a carefully prepared and controlled setting with other medical professionals (albeit without the skills of the person controlling the robot) standing by. “Slow things down” indeed. In Earthly trials, tying a knot via a telebot with a two second lag took volunteers at least ten minutes. With a sub-500ms lag, it feels “live” and takes less than a minute. The “teleop” surgeons in lap surgery are in the same room as the patient. They handle instruments that look just like standard surgical scissors, clamps, etc, it’s just that there’s a computer betwixt the one end of the instrument(s) and the other. Google it, it’s kinda cool.